Here are 100 of the most cromulent quotes from the first eight seasons of The Simpsons, ranked (fairly randomly) from worst to best. From "Marge vs. the Monorail" (Season 4, Episode 12). From "Radioactive Man" (Season 7, Episode 2). 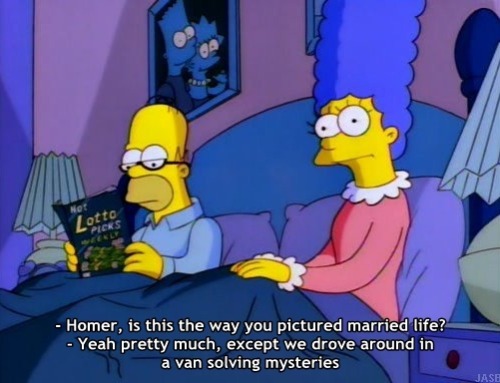 From "El Viaje Misterioso de Nuestro Jomer (The Mysterious Voyage of Homer)" (Season 8, Episode 9). From "Itchy & Scratchy Land" (Season 6, Episode 4). From "Homer vs. the Eighteenth Amendment" (Season 8, Episode 18). From "Homer the Smithers" (Season 7, Episode 17). From "Homerpalooza" (Season 7, Episode 24). From "Bart Sells His Soul" (Season 7, Episode 4). From "King-Size Homer" (Season 7, Episode 7). From "Team Homer" (Season 7, Episode 12). From "Lisa on Ice" (Season 6, Episode 8). From "And Maggie Makes Three" (Season 6, Episode 13). From "The Crepes of Wrath" (Season 1, Episode 11). From "The PTA Disbands" (Season 6, Episode 21). From "Treehouse of Horror IV" (Season 5, Episode 5). From "Lisa the Vegetarian" (Season 7, Episode 5). From "Mountain of Madness" (Season 8, Episode 12). From "Marge on the Lam" (Season 5, Episode 6). From "22 Short Films About Springfield" (Season 7, Episode 21). From "A Streetcar Named Marge" (Season 4, Episode 2). From "Summer of 4 Ft. 2" (Season 7, Episode 25). From "Lisa's Wedding" (Season 6, Episode 19). From "Who Shot Mr. Burns? (Part Two)" (Season 7, Episode 1). From "You Only Move Twice" (Season 8, Episode 2). From "Bart Gets Famous" (Season 5, Episode 12). From "Principal Charming" (Season 2, Episode 14). From "A Milhouse Divided" (Season 8, Episode 6). From "I Love Lisa" (Season 4, Episode 14). From "Homer's Enemy" (Season 8, Episode 23). From "Treehouse of Horror III" (Season 4, Episode 5). From "Bart's Comet" (Season 6, Episode 14). From "Homer the Vigilante" (Season 5, Episode 11). From "The Last Temptation of Homer" (Season 5, Episode 9). From "The Springfield Files" (Season 8, Episode 10). From "Bart's Girlfriend" (Season 6, Episode 7). From "Bart Gets an Elephant" (Season 5, Episode 17). From "Homer's Phobia" (Season 8, Episode 15). From "The Canine Mutiny" (Season 8, Episode 20). 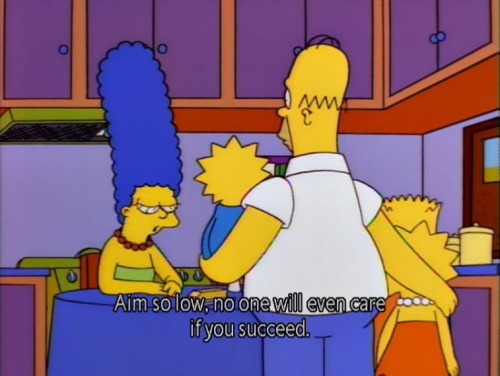 From "Marge Be Not Proud" (Season 7, Episode 11). From "Bart of Darkness" (Season 6, Episode 1). From "Lemon of Troy" (Season 6, Episode 24). From "Lisa the Iconoclast" (Season 7, Episode 16). From "Like Father, Like Clown" (Season 3, Episode 6). From "Homer Badman" (Season 6, Episode 9). From "Dancin' Homer" (Season 2, Episode 5). From "The Day the Violence Died" (Season 7, Episode 18). From "Brush With Greatness" (Season 2, Episode 18). From "Homer's Triple Bypass" (Season 4, Episode 11). From "The Old Man and the Lisa" (Season 8, Episode 21). From "Much Apu About Nothing" (Season 7, Episode 23). From "Lisa vs. Malibu Stacy" (Season 5, Episode 14). From "Scenes From the Class Struggle in Springfield" (Season 7, Episode 14). From "Lisa's Rival" (Season 6, Episode 2). From "Bart the Fink" (Season 7, Episode 15). From "The Itchy & Scratchy & Poochie Show" (Season 8, Episode 14). From "Cape Feare" (Season 5, Episode 2). From "Sideshow Bob Roberts" (Season 6, Episode 5). From "The Twisted World of Marge Simpson" (Season 8, Episode 11). From "Lisa's Date With Density" (Season 8, Episode 7). From "Treehouse of Horror V" (Season 6, Episode 6). From "Bart's Inner Child" (Season 5, Episode 7). From "Itchy & Scratchy: The Movie" (Season 4, Episode 6). From "Grade School Confidential" (Season 8, Episode 19). From "Lisa the Beauty Queen" (Season 4, Episode 4). From "Bart After Dark" (Season 8, Episode 5). From "Burns' Heir" (Season 5, Episode 18). From "Homer the Heretic" (Season 4, Episode 3). From "Bart's Friend Falls in Love" (Season 3, Episode 23). From "Colonel Homer" (Season 3, Episode 20). From "Lisa's Substitute" (Season 2, Episode 19). From "Homer the Great" (Season 6, Episode 12).